Joseph Boyden is a Giller Prize-winning author — his second novel, Through Black Spruce, won the prize in 2008. His third novel, The Orenda, was long-listed for this year’s Giller, but did not make the cut when the shortlist was announced earlier this month. The Shadow Giller Prize Jury made the unusual decision of “calling in” the title and we will be considering it alongside the five books on the official list vying for the prize. This means we may well decide that The Orenda is worthy of the Giller, even if the official jury overlooked it. I have to admit that out of all the books I’ve read on the shortlist so far, this is by far my favourite. I loved it on many levels — indeed, I was completely enraptured by it — and almost three weeks after having finished it, the story still lingers in my mind. But I must post a warning here: this book includes many gruesome and violent scenes. They are not gratuitous, but they are visceral, and some readers may decide this really isn’t for them. That, however, would be a great shame, because this is a terrific novel about the “birth” of Canada as a nation and the subsequent struggle between two starkly different belief systems: that of several First Nations tribes and that of the French Jesuits trying to convert them to Catholicism and a western way of life. 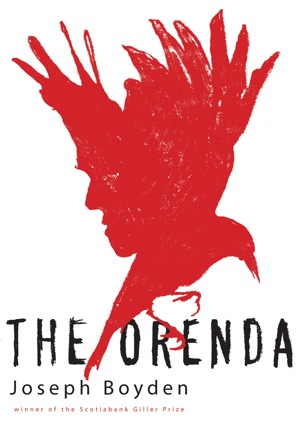 Set in the 17th century, The Orenda plunges the reader into the vast wilderness of Eastern Canada and takes us on a sometimes terrifying, occasionally humorous, but always fascinating journey following members of the Huron nation as they go about their daily lives over the course of many seasons. This natural world is brought vividly to life through Boyden’s beautiful prose — indeed, every time I opened the pages of this book it was like stepping into another world, so vastly different to my own, but so wonderfully rich and evocative that I would feel a sense of dislocation whenever I closed the book and went about my normal life. The story revolves around three main characters: Bird, a Huron warrior mourning the loss of his wife and daughters killed by the Iroquois; Snow Falls, an Iroquois child, kidnapped by the Huron and brought up by Bird as his new daughter; and Christophe, a French Jesuit missionary, determined to convert the savages to Catholicism. Each character takes their turn to tell their story in alternate chapters — and each is written in the first person, present tense, which provides a sense of urgency and immediacy. A fourth character, Gosling, a medicine woman features heavily, but does not narrate her story. Joseph Boyden’s Through Black Spruce won the 2008 Scotiabank Giller Prize, Canada’s premier fiction award. It was recently released in the United Kingdom, which makes it eligible for this year’s Man Booker Prize. Since this blog did not exist last fall and I haven’t commented on it, that seemed a good excuse for a reread. It was my personal second choice for the Giller (in a deadheat with Barnacle Love by Anthony De Sa) — the reread only confirms the deadheat. The book is the second in a projected trilogy. The first, Three Day Road, also was critically well-received and won some minor prizes. I don’t think the two need to be read in order — I didn’t, and I think for many readers reading Through Black Spruce first might be a good idea. You will see why later in the review. The book is told in two first person narratives, alternating by chapter. One is that of Will Bird, a 55-year-old trapper and bush pilot in Moosonee, Ontario (that’s a native community right at the south end of James Bay, if you aren’t up on your Ontario geography). The other is his twentysomething niece, Annie, now living (and trapping) from her camp 15 miles outside of Moosonee, just returned from eight months in the South, in search of her younger sister. Will is in a coma as the book opens, the result of a spat with the Netmaker family, the local bootleggers who have now moved on to controlling the drug trade. He begins his narrative by telling us that he has survived three plane crashes — we get the sense immediately that he is used to being near death. The seeds are also sewn for the hope that he will survive this one too. As we will discover, the Netmakers and Birds have been feuding for quite a while, perhaps generations. This latest outrage arises from a belief that Will has been informing on them — but Boyden merely uses that to supply a context which allows Will to explore his past, both distant and recent. It also allows this half of the narrative to move geographically north at points, into the islands of James Bay. Annie is visiting her uncle in hospital — her nursing friend, Eva, tells her that simply talking would be good for him. So she begins to tell the story of her recent months. Each of her chapters, however, begins in the present — first at the camp (she has brought a male native friend she found on the streets of Toronto back with her). Her younger sister, Suzanne, left Moosonee 17 months ago, on a snowmobile headed for Toronto (with a Netmaker, of course). The family knows that Suzanne found her way into the fashion model world in Toronto, Montreal and Manhattan (fashion magazines even make their way to Moosonee). A “holiday” one-week trip to Toronto sent Annie off on an eight-month unsuccessful search. I will make no attempt to further outline the plot — while it is certainly important to the book, it is not where the real strength lies. Two other aspects of Boyden’s work are what make this a truly unique novel, as far as this reader is concerned. The first is the way that he mixes conventional and aboriginal narrative models to tell his story, just as he uses two narrators. In the conventional sense, Through Black Spruce, does have a chronology, albeit one that unfolds with considerable use of flashback. In the oral tradition of the native people, however, that does not happen in a linear fashion. Instead, in each chapter, both Will and Annie begin in the present, find aspects of the present that set off memories of the past and then develop those memories. It is the literary version of creating a tapestry or quilt (not that I know much about either of those things, but I think the metaphor applies). Each piece is carefully and completely developed, throughout most of the overall chronology. Then it is set aside and work begins on another piece. Only as the book begins to approach a conclusion does the author begin to stitch together the various pieces to complete the overall picture. Boyden is masterful in the way he uses this technique. The second powerful strength to the book is that in every one of those pieces Boyden explores, in some depth, the conflict between traditional and modern life and the need (and difficulty) that both Will and Annie face in somehow finding a resolution. They are a generation apart so it has different aspects (he becomes a bush pilot who flies north, she heads south and herself becomes a model) — but the underlying tension for both remains the same. It is impossible not to be deeply touched by and enrolled in the challenges (and failures) that the two central characters face. Now, as promised, back to Three Day Road. It is the story of Elijah and Xavier (who is Will Bird’s father, Annie’s grandfather), two Ojibway from Moosonee who head off to France to fight in the Great War. They become a legendary pair of snipers (they lived off hunting back home, after all) before Elijah is killed. Again, Boyden plays with time — in the present tense in this book, Xavier has returned and his mother is rowing her shell-shocked son down the Moose River to home, which sets off the same tapestry of flashbacks. Again, Boyden explores the conflict between finding a compromise between traditional and contemporary ways — this time more than half a century earlier. Both books indicate not much has changed. I didn’t read Three Day Road when it first came out in 2005 because, I will admit, I was suffering from Great War reading overload and couldn’t face another volume about a depressing war. I assure you I picked my copy up very quickly after finishing Through Black Spruce. If I have adequately conveyed the idea of the way Boyden develops his narratives in the same way an artisan stitches a tapestry, it doesn’t matter which you read first — at least, it didn’t to me. Does this book have a shot at the ManBooker longlist, at least? The Canadian in me would love to think so. Even if it doesn’t, if you would like to develop an understanding of the challenges that have faced the native people of Canada for the last century and more (and, quite frankly, Australia, New Zealand and the United States as well), I can’t think of a better place to start.